Gurgaon is a part of the NCR region of India. It is officially called as Gurugram. Gurgaon is an Indian city in Haryana state. It is the second largest city of Haryana. Gurgaon is a hub of many reputed universities/institutions which offer an excellent education to the students in various engineering specializations. As per the recorded census 2011, the overall literacy rate of Gurgaon is 84.70%. Check here to get complete details about the list of Top Engineering Colleges in Gurgaon 2019. Here, we have updated information about entrance exams, top engineering colleges, admission procedure, etc. Here, we are presenting the list of top engineering colleges in Gurgaon for the academic session 2019-20. In this list, we have included top government and private institutions which offer four years B.Tech programme. The rating of all the institutions is given by our experts on the basis of given parameters. These factors are infrastructure, academic excellence, quality education, national importance, placement record, world-class faculty, feedback of student, facilities provided by colleges, etc. The admission to the engineering courses in Gurgaon city will be done on the basis of JEE Main. NTA is the authority which organizes this exam to get admission to the Bachelor of Technology (B.Tech) & Bachelor of Architecture (B.Arch) courses. There are some colleges/universities which conduct its own university level exam for providing admission to the engineering programmes such as KIITEE. Candidates, those want to pursue M.Tech course in this city, they have to appear for the GATE exam. Students can study various specializations of engineering course as per their interest. The most trending specializations among the students are Mechanical Engineering, Aeronautical Engineering, Civil Engineering, Electrical Engineering, Computer Science & Engineering, Electronics & Communication Engineering, etc. 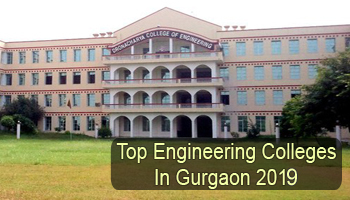 If you have any other query about Top Engineering Colleges in Gurgaon 2019, you can ask us by leaving your comments in the comment box.